From an early age, many of us are introduced to the terms carnivore, herbivore, and omnivore; animals which consume other animals, plants, or both animals and plants respectively. These terms, while useful, are highly generalized and may overlook the often significant complexity in the diet of a given species. Many animals often considered to be ‘carnivorous’, for example, may ingest particular types of plants depending on the situation. Similarly, many animals traditionally thought of as ‘herbivores’ have been observed feeding on other animals, albeit in small quantities. This shows that animal feeding behaviors are not as fixed as we are taught in school and, in some instances, it may be necessary to use alternate means of classification. To simplify matters, most animals may be grouped into one of three categories based on the amount of animal matter that they consume: hypercarnivore, mesocarnivore, and hypocarnivore*. *The following descriptions will focus exclusively on mammals, but the aforementioned terms still apply for other animal groupings. that this varies between species. A hypercarnivore is an animal for whom over 70% of the diet consists of animal matter, with non-animal matter (plants, fungi, or algae) being consumed rarely as a dietary supplement if at all. The prefix hyper- comes from the Greek language and in simplest terms translates to “over”. Thus, the word hypocarnivore describes an animal that is highly predacious and requires a huge amount of animal protein to sustain itself. Some hypercarnivores, such as cats, have a reduced ability to digest sugars or carbohydrates, and must therefore rely entirely on animal matter (the term “obligate carnivore” may also be used in this instance). Hypercarnivory in terrestrial mammals is often, but not always, accompanied by a suite of changes to the skull and dental morphology. The face may be shortening and/or deepening of the face may occur in association with the reduction or loss of pre- and post-carnassial dentition. The carnassials themselves (pictured to the right), laterally compressed cheek teeth adapted for cutting through flesh, are often lengthened to expand the slicing surface while reducing the capacity for crushing. Hypercarnivorous taxa are relatively easy to identify in the fossil record because of these adaptations. Notable mammalian hypercarnivores include all members of Felidae (cats), Phocidae (seals), Otariidae (sea lions), and Cetacea (whales), as well as most members of Mustelidae (weasels), Herpestidae (mongooses), Chiroptera (bats), and Eulipotyphla (shrews). Additionally, some hypercarnivores may be specialized in taking certain types of prey and are often categorized accordingly: insectivores (invertebrate-eaters), piscivores (fish-eaters), or molluscivores (mollusk-eaters) to name a few examples. It should be noted, however, that animals tend to be opportunists, very rarely limiting themselves to a single food source. River otters, for example, are adapted to a mostly fish-based (piscivorous) diet but will readily feed on many other types of animals including crustaceans, frogs, birds, and small terrestrial mammals whenever they are encountered. 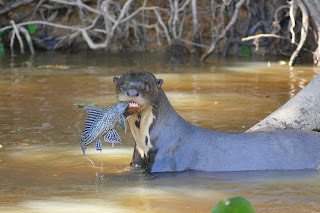 hypercarnivores that specialize in eating fish (wiki). A mesocarnivore is any predatory animal for whom animal matter comprises 31-70% of the diet. These animals actively feed on animal matter but will readily feed on non-animal foods such as fruits and fungi, hence the prefix meso- which means “middle”. Compared to hypercarnivores, mesocarnivores may be more numerous in a given terrestrial ecosystem due to their diet being more adaptable. Furthermore, the proportion of animal to non-animal matter may vary depending on location and seasonality. Red Foxes, for example, may feed almost exclusively on small animals for much of the year but may shift to a more plant-based diet during the autumn months in some parts of their range. Mesocarnivorous mammals often have relatively elongate skulls with a more compete dentition adapted for dedicated to piercing, slicing, and crushing. 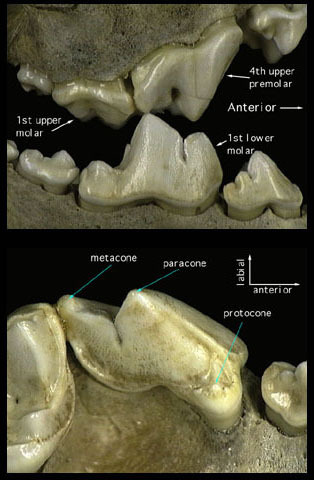 the expanded grinding area of the carnassials and molars (wiki). The prefix hypo- means “below” or “beneath”. Thus, the term hypocarnivore describes an animal for whom animal matter makes up 30% or less of the total diet. To extract as much nutrients as possible from the plants they eat, hypocarnivores have expanded the grinding aspect of their dentition, having either reduced or lost those areas dedicated to slicing. Also, the stomach and intestines may be longer and more complex. Notable hypocarnivores among the Carnivora include most bears, raccoons, palm civets, and the Red Panda. These animals independently evolved from mesocarnivorous ancestors that became specialized for a more plant-based diet. Other examples include all primates, peccaries, pigs, fruit bats, and most rodents. for processing tough plants such as bamboo. Like hypercarnivores, some hypocarnivores may specialize in feeding on particular types of foods, in this case non-animal matter, and may be categorized accordingly: frugivores (fruit-eaters), folivores (leaf-eaters), granivores (seed-eaters), and nectarivores (nectar-eaters), and fungivores (fungus-eaters). As with mesocarnivores, hypocarnivores may show considerable versatility in their diets depending on location and season. The diets of Black Bears and Brown Bears, for example, generally consist of 90 to 95% non-animal foods for much of the year. Immediately following winter hibernation, however, the bulk of their food intake may consist of winter-killed ungulates and other animals that failed to survive the winter. Other spikes in carnivory are associated with the spawning or birthing seasons of certain types of fish and ungulates respectively. The Polar Bear is a rare instance of a hypercarnivorous species evolving directly from a hypocarnivorous ancestor. feeding on dandelions, are hypocarivores whose diets are mostly plant-based. evolved directly from a hypocarnivorous ancestor. River Hippopotami, which feed almost exclusively on grasses, have been filmed scavenging from the carcasses of animals which have either drowned or were killed by large predators (video). Giraffes, which normally feed on leaves and fruits high above the ground, are known to chew on the bones of other animals when they stumble upon them (video). Deer, cattle, and horses have also been filmed eating dead or unattended bird chicks (video1, video2, video3, video4). These behaviors may seem unusual to the casual observer, but they are likely the result of animals attempting to compensate for the lack of certain nutrients which may be lacking in an otherwise plant-based diets. Although these particular animals lack the physical attributes necessary to actively hunt and kill live prey animals, they will clearly take advantage of animal protein when they can obtain it.